A sunset in a small rural village of Matatiele - Eastern Cape province, near the Lesotho mountains. Muhtle, 11, sits on his horse after a heavy rainfall. This is his father's horse; it is the strongest and biggest horse in the village. Thabo, 13, rides one of his father's seven horses through the mountainous landscape of Matatiele. Malign, 87, worked his entire life underground, digging for gold in the mines of Johannesburg. Today, he needs care and help from the community to manage the daily routines. Scwebu, 46, rushes home after a long day on the farm. Smalls (14) and Jake (14), return from a fierce horse race, which they won. They are the fastest guys in Matatiele. They live in the same village and go to school together. 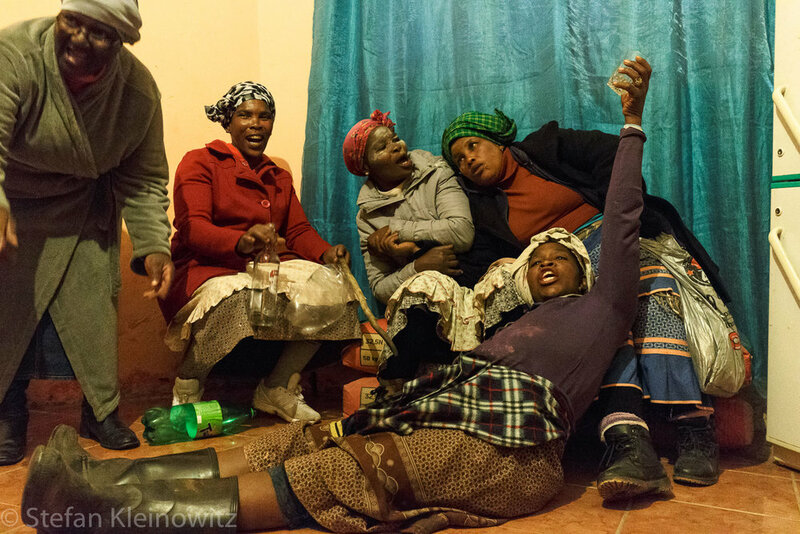 Xhosa women and mothers of initiates drink a lot of alcohol to celebrate their son's transition into manhood. Tomorrow their 'children' will return from the mountains and reunite with their families and communities as respected men. Three friends drink alcohol in the early evening outside a bar. Alcohol plays a big part of daily life at the Eastern Cape. Alcohol consumption is very normal and often explained as part of the culture. However, the alcohol consumed is no longer homemade traditional beer but strong and expensive liquor, which is enjoyed by many on a daily basis. People would often go without food for the entire day, but spend money on alcohol. Kahlo, 16, gets ready for the Sunday church service. The Sunday service is very important amongst the Xhosa and Sotho people. It creates positive spirits in the communities, togetherness and a network of support. The ceremonies can become emotional when attendees occassionally cry, scream, sing or stomp their feet to the rhythm of the drums. About twenty-five people visit the Sunday church service. The attendees are family members, close friends and neighbours. The service lasts for more than three hours. 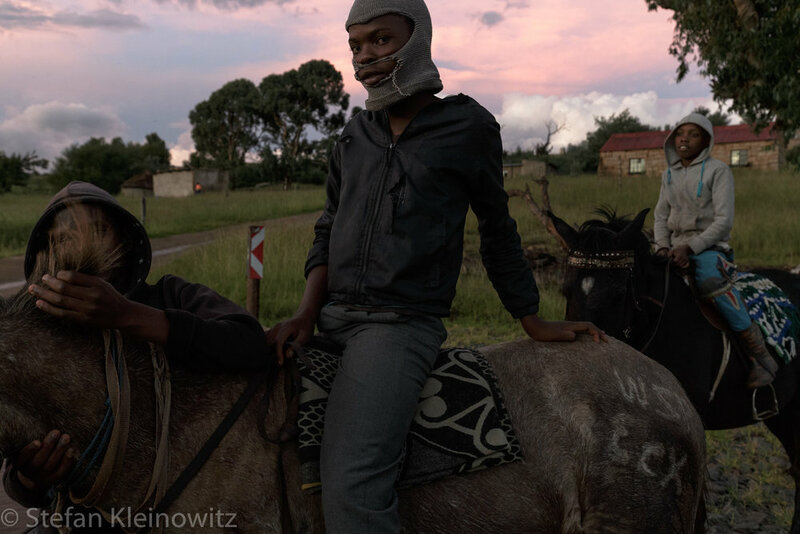 Thabo, 13, rides his horse home. 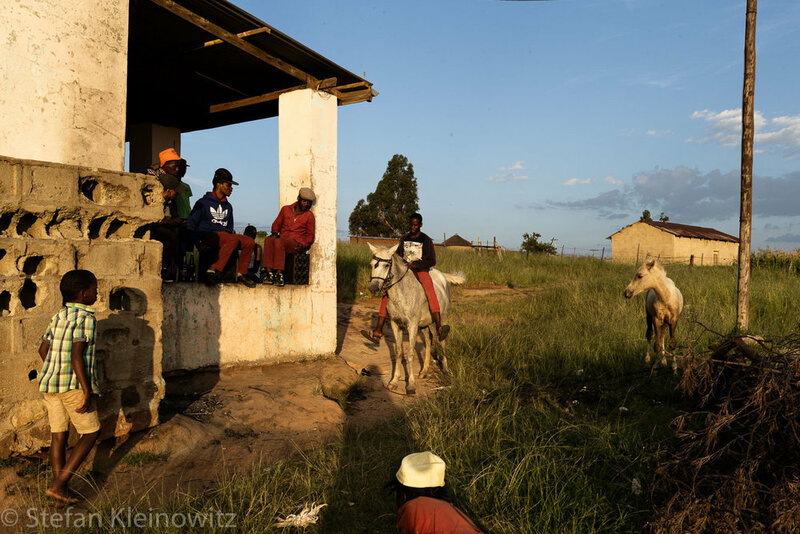 Three friends ride their horses in a small village named Zikhalini, in Matatiele - Eastern Cape Province. 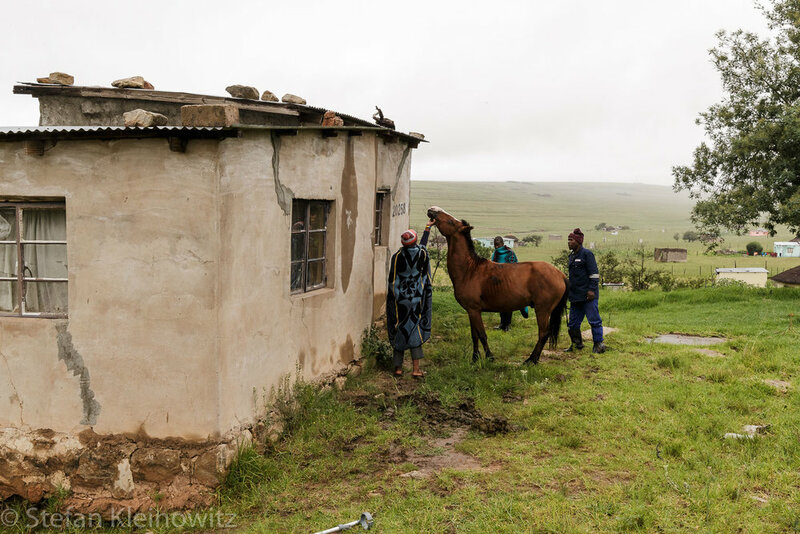 There are approximately 80 horses in this village, which is inhabited by Sotho and Xhosa people. Three Sotho guys covered in Sotho blankets have difficulties to control one of their wilder horses. Smalls, 14, uses the whip to make his horse jump. He is officially the fastest in his village and the horse, which he inherited from his father, is number one. Two Sotho men sit on their horses and are covered in their Sotho blankets. Early in the morning, school children brush their teeth in the garden and prepare for school. 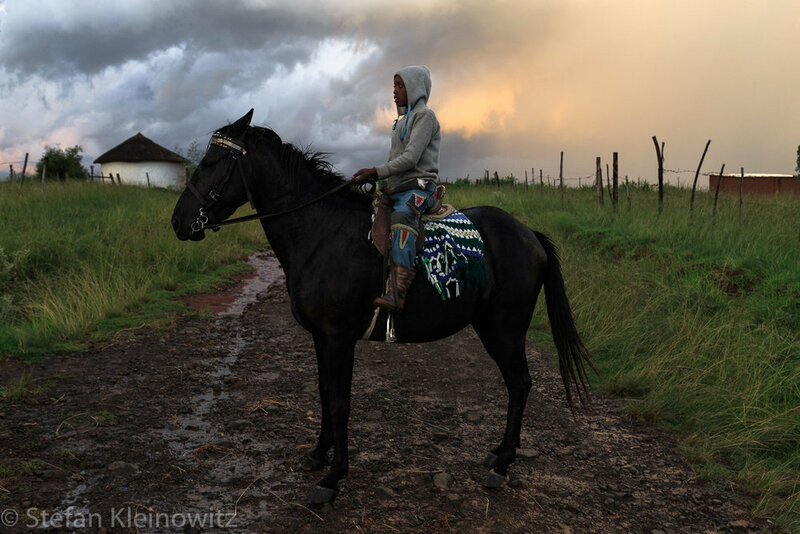 Thabo, 13, rides his horses home. A rural village at the Eastern Cape - Queenstown. People relax and drink outside a bar, in the village of Zikhalini. There is not much to do in the rural areas of the Eastern Cape. The tavern is the place where people meet, drink, dance, fight, smoke, lime in the grass or just pass by. Xhosa men sit together and drink traditional home made beer. 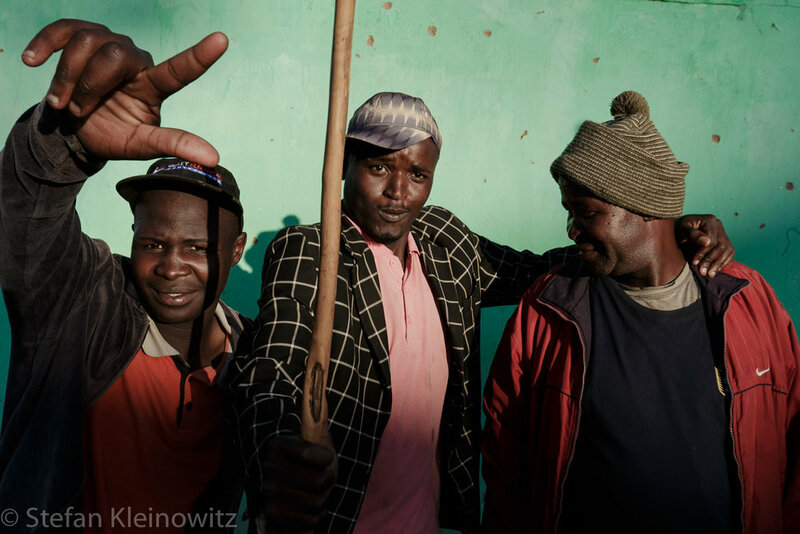 Xhosa and Sotho men from two neighbouring villages meet to participate in a horse race. Friends and neighbours of a village drink bottles of Black Label in a small tavern. Friends sit together and drink large bottles of beer after a horse race. Also Smalls, who is only 14 is allowed to sit with the older 'guys' due to his excellent riding skills. Friends sit together after a horse race and drink beer. 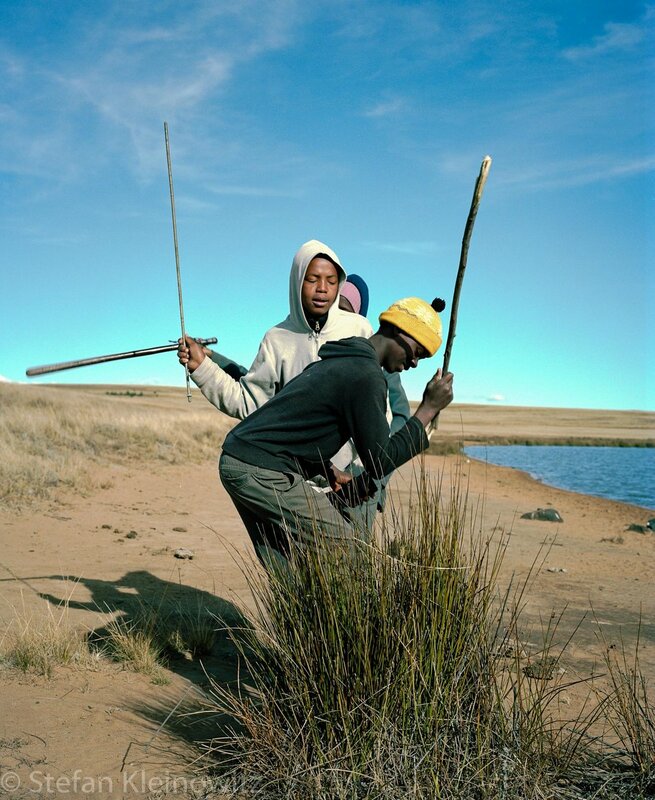 Hlubi tribe initiates return home after they spent five weeks on the mountains. At 5:30 a.m in the morning, initiates throw their spears towards the rising sun. For a majority of women at the Eastern Cape it is a daily routine to carry buckets of fresh spring water from the water source to their household. Running water, sanitation, and electricity have not reached small, and remote rural villages. People gather around a water spring or arrive with cars, to collect fresh water for their households. 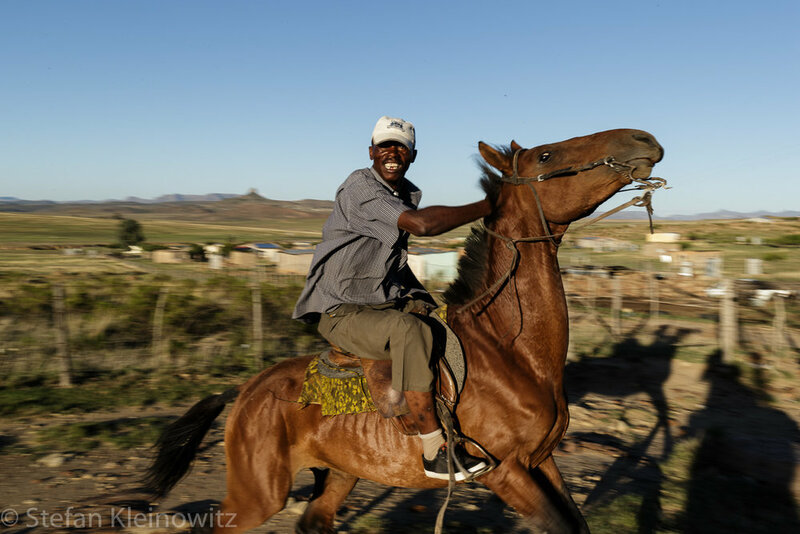 Horses are the fastest mode of transport in the mountainous rural areas of the Eastern Cape. Bulelani, 29, ex convict at an initiation ceremony, and a proud member of the 28 gang. Sabelo, 6, sits on his favourite horse. 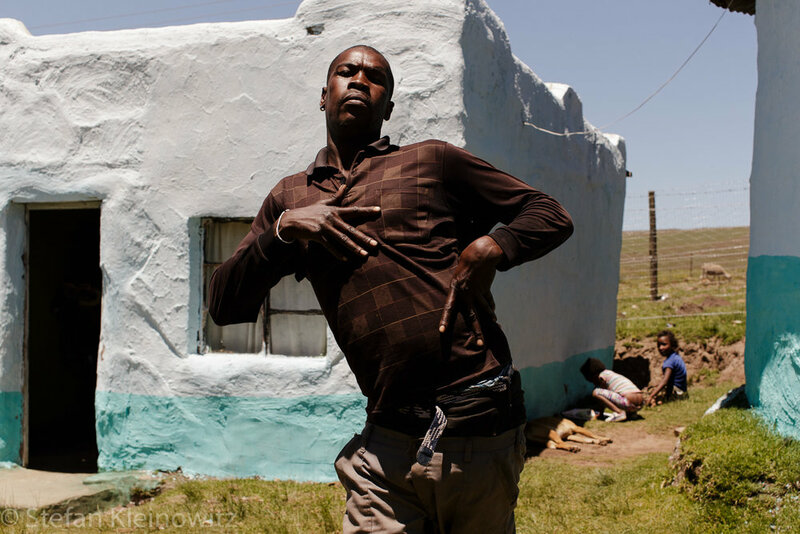 Bulelani, 29, ex convict at an initiation ceremony and a proud member of the 28 gang. At an open fire place Xhosa women prepare meat for an initiation ceremony. During December and January, Xhosa and Sotho people celebrate the initiation of their boys. On this occasion ten slaugthered sheep are laid out for an initiation ceremony. The meat will cater for over 50 hungry initiates, their families and friends. A bride stands with a bouquet of flowers next to the car of her husband's family. In some larger villages of the Eastern Cape, where people have been able to accumulate wealth through cattle, farming and illegal diamond mining, German cars such as a VW Polo or Mercedes Benz have become the new status symbol. Cars and bigger houses with electricity and running water have replaced horses as a sign of wealth and social status. A young girl attends a wedding and plays with her stylish smartphone. In villages in which people have gained financial power the living standards have increased drastically. Instead of cattle and horses, fashion, new cars, and smart phones have become status symbols of the new middle class. A couple of the Xhosa tribe gets married. 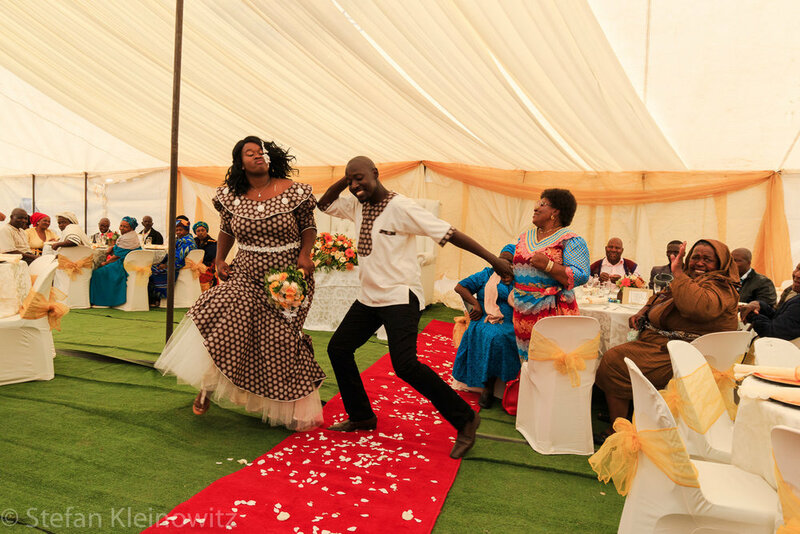 A freshly married couple dances in front of family and friends. A traditional healer reads the bones in front of him and tells his patient how to deal with family issues and other personal problems. This is his father's horse; it is the strongest and biggest horse of the village. Hlubi initiates from the Sotho tribe just returned from the mountains, sit under a tent and sing traditional songs. Then, each of the initiates stands up and introduces himself, and his new clan name to the audience. Sotho initiates just returned from the mountains, sit under a tent and sing traditional songs. Each of the initiates stands up and introduces himself, and his new clan name to the audience. Women dance and sing to welcome the returning initiates from the mountains. Family members, who live in the same household, sit together around a bed in the kitchen. Thabo, 13, rides his horse to look for his father's sheep. James is 75, and grandfather of thirteen grandchildren. He owns five horses, fourteen cows, and over thirty chickens. This is his youngest horse, and his favourite. He says,that it is a bit stubborn and unpredictable, but very fast. The red blinkers help the horse to look straight, and prevent the horse from becoming distracted during a horse race. James uses it sometimes for fun. His grandchildren use it every day to travel, to look after the cattle, and to race across the villages. Junior, 16, is dressed in his Sunday outfit and enjoys one of his grandfather's five horses. Luis, 14, sits on the bed in one of his family's mud houses, which he shares with his older brother and father. The blue round shaped house serves as a sleeping room, community area and a kitchen. 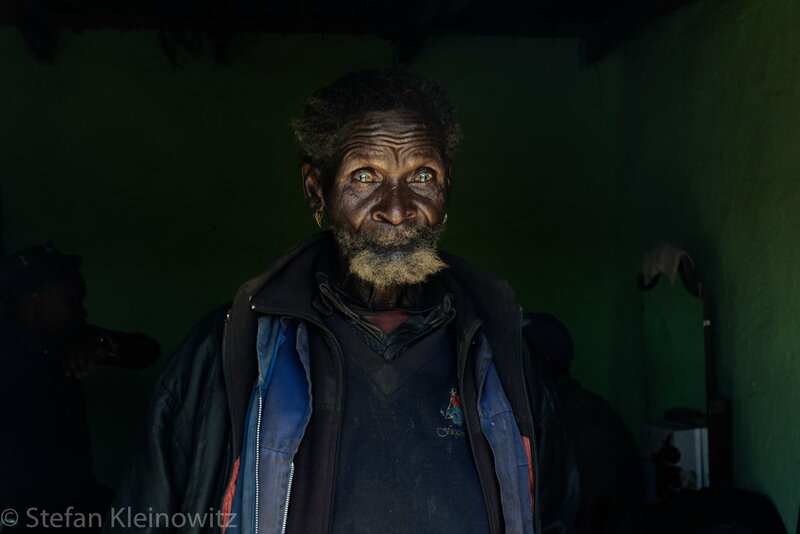 Thabo, 72, sits in his mud house and listens to the radio. He complains that there is nothing to do and that life is hard. The government has promised them all kinds of things, but has not delivered any of their promises. Jake, 23, sits on his bed and smokes cannabis. He says: 'I have nothing to do all day. I have finished school, but for what? There are no jobs. I am bored, and if I stay at home all day I would become crazy. To keep myself busy I wake up in the morning, then go to town and push people's trollies outside the Spar supermarket. Then I come back home to the village and sell cannabis, and hang out with my friends. 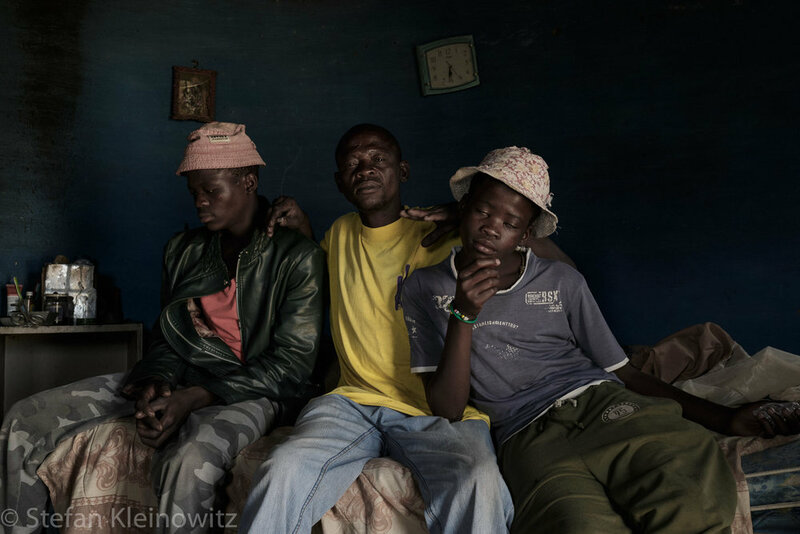 Zola, 47, lives with his mother and his brother (45) who is in a wheelchair. 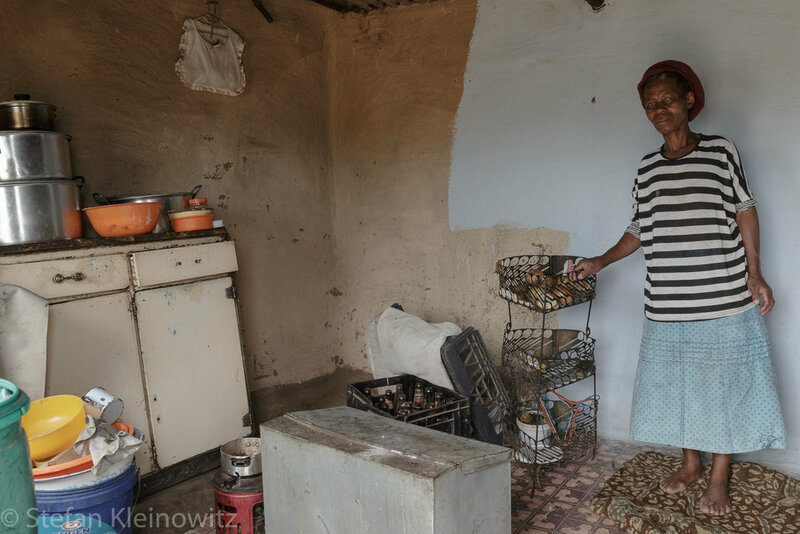 Zola creates and sells furniture, and with the small income he supports his mother and handicaped brother. 'The government does not care about us. They have never done anything for the people living around here. I have stopped to vote for any politician. They are all liars'. Martha, 67, stands in the kitchen of her small house. Kagiso, 35, sits in his mud house, which serves as a kitchen and a sleeping room for him and his two brothers. Thebo, 20, dropped out of school and sells cannabis. 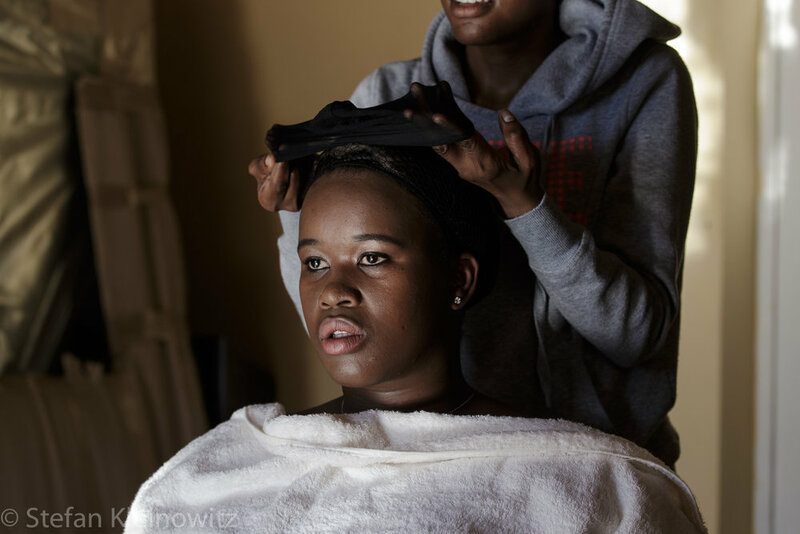 'My friends who finished school are all without a job, or they have left to Johannesburg. Kahlo, 16, races his grandfather's horse through the village.